You may get auto aggroed by Group A upon warp-in, but in some other circumstances, there will be no aggro as you warp-in. Attacking Group A will aggro Group B. Groups C and D can be aggroed individually. Attacking Group E will aggro the entire pocket. 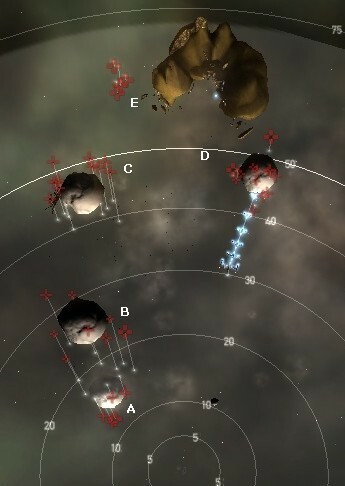 Drones can be deployed normally and do not cause pocket aggro. If Group A does not auto aggro at warp-in, eliminate Group B first and then Group A. Recommended order of elimination : Group B, Group A, Group C, Group D and finally Group E.
Auto aggro from all upon warp-in. 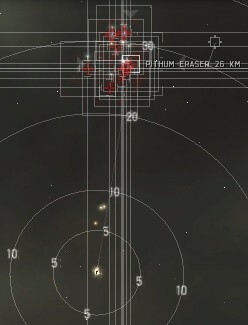 Storage Silo drops Caldari CU-1/AZ-1/BY-1 Nexus Chip and some trade goods. All other structures drop no loot. Last ship killed will drop the storage containers needed to complete the mission. Make sure you loot it.